The Fianna Fáil leader said it was “very serious” that junior minister Alex White agreed that the Taoiseach forced the former Garda Commissioner to quit. 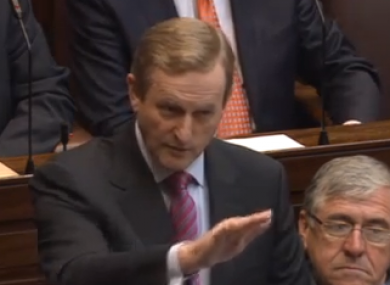 Enda Kenny in the Dáil today. MICHEÁL MARTIN has again re-asserted his claim that Enda Kenny essentially fired former Garda Commissioner Martin Callinan. Martin said he was not alone in holding this view, referencing the letter sent to Labour members by junior health minister Alex White last week in which he is said to have made the same claim. The Fianna Fáil leader said this was a “very serious assertion by one of your own government ministers”. Kenny said he had not spoken to White, who is in the running to become the next Labour leader and Tánaiste, about the letter. He added that he did not accept the claims. “You won’t stand over [the charge you're making] the way you’re going,” Kenny said. Martin responded: ”You’ve some neck to come in and lecture me about it when one of your ministers has made the assertion”. Controversy has surrounded the visit of the secretary-general of the Department of Justice, Brian Purcell, to Callinan’s house the night before he resigned in March. Today, Martin said the visit, which was at the request of the Taoiseach, was an ”unprecedented move which could only have one outcome”. When Kenny said that the facts about the issue would come out in the Fennelly inquiry into the taping of phone calls at Garda stations, Martin told him ”you can’t hide behind Fennelly for a year and a half”. Also during Leaders’ Questions, independent TD Maureen O’Sullivan called on Kenny to support Irish SMEs with the same “aggression” that the government uses when seeking foreign direct investment. She said that multinational companies are “very adept” at tax avoidance and “more likely to let employees go” than Irish businesses. The Taoiseach said the government was committed to supporting SMEs. Kenny said that O’Sullivan made some valid points, but he rejected her assertion that “multinationals come in and they avail of the tax concessions and then they head for the hills”. This morning it was announced that the European Commission has launched an official probe into whether Ireland broke rules on state aid as part of a tax deal offered to Apple. Kenny said the government was committed to cooperating with the OECD to respond to the issue in an international context. Email “"You've some neck" - Martin calls for Kenny to admit he 'fired' Callinan”. Feedback on “"You've some neck" - Martin calls for Kenny to admit he 'fired' Callinan”.